my first Neji wall...A decent picture of Neji which u can find almost everywhere. The bg is so cool! The black and green looks awsome! Great job! Can't wait to see more walls from you. Very nice grunge cloudy effect fukushuusha! I'm not sure but have you tried to see what effect the main cut would have if you blended it behind the bg effect? Just a suggestion if you haven't tried it. Looks cool nonetheless. Wow! What a cool background! It goes great with the scan. Excellent job! Quote by Chloe-chanWow! What a cool background! It goes great with the scan. Excellent job! Liking the dark and eerie atmosphere that you've got going there. I think it would've been cool to see the whole 360 degree vision thing from early in the series in this wall. Anyways nice work! The background was done nicely and also the color choices. The image choice is also great! This is a good wallpaper, keep it up. 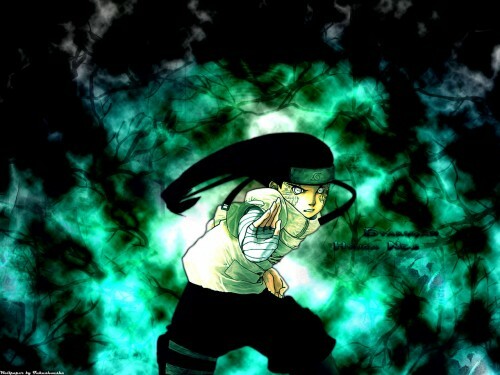 Cool Neji! I like him! Nice background. Keep it up!